So there’s been some scuttlebutt on the island as of late regarding fishing, shark fishing and swimmers/snorkelers. Now, I’m not privy to the graphic details of conversations, but I am aware of the gist of them. I won’t go into all of that right here, but I will give my opinion on the entire situation and leave it at that. Let me first say that I love fishing. I grew up fishing. I still fish now and then. I support our fishermen and encourage them to fish. I enjoy sharks – thoroughly, actually. As a child I was obsessed with them. I could tell you anything about any species. If I could have had one in my bathtub as a pet, I would have. Now as an adult, I still love sharks. I still have a respectable knowledge of them. I don’t fear them necessarily, but I do respect them and their habitat. About two weeks ago, my friend and I decided to go diving for shells. Our first choice didn’t look like a good spot that morning, so we decided to meet at Blind Pass. 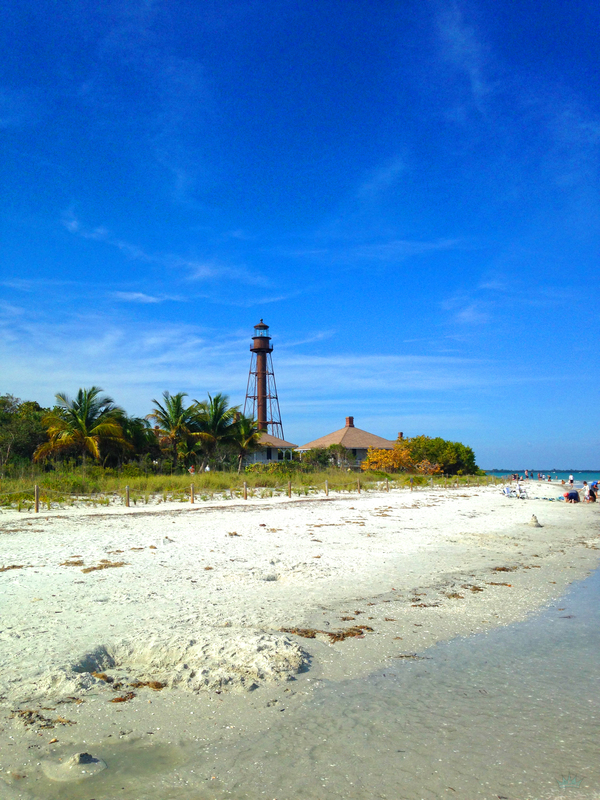 We’d snorkel the Sanibel side, move across the channel and hit the Captiva side all the way up North. 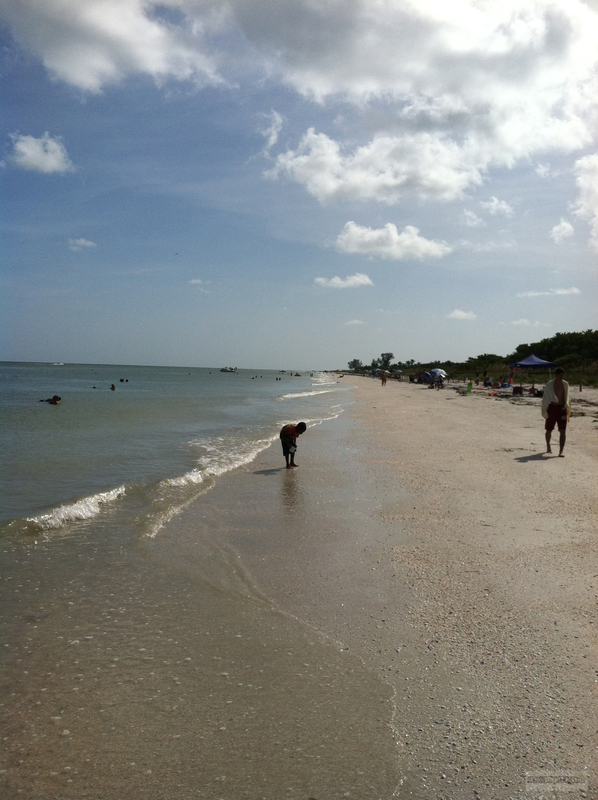 We didn’t find much luck on the Sanibel side, so we moved to the Captiva side. 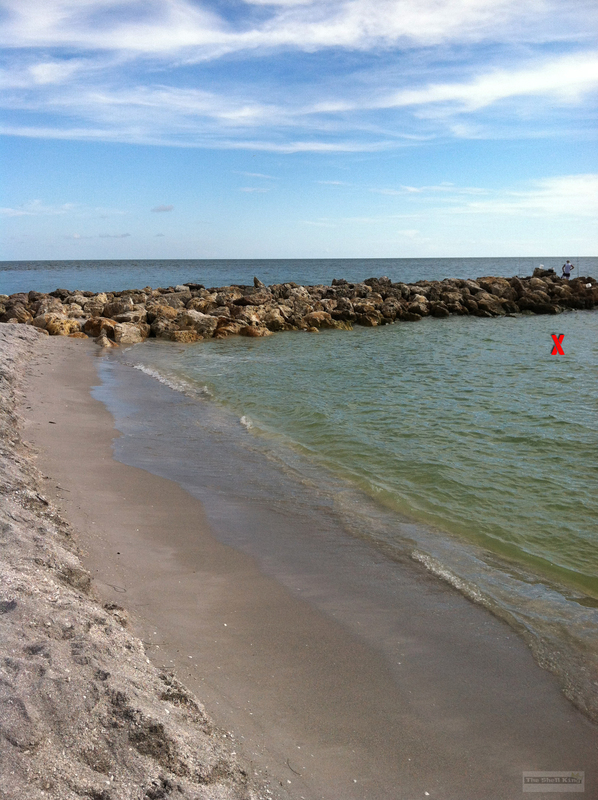 Within 3 minutes of hitting the water at the Captiva jetty (my friend 5 feet behind me), I came face to face with a Blacktip shark – literally an arm’s length away as I stood in 4 feet of water (see the pic below of the location – X marks the spot, even though this is an older picture and the jetty doesn’t quite look like that now). He was small, maybe 3, 3 ½” feet, but he startled me. I startled him as he darted away quickly. After catching my breath (haha) we dove down and within a few feet from us was a very large ray head. It was a good foot and a half chunk. This was what our shark friend was nibbling on. Disturbing, I know. How many of you reading this have stood in that exact spot? As we continued to dive North, we came across quite a bit of bait/chum. Fileted fish, fish heads, chunks of meat, you name it….and the two of us were clearly getting more and more angry as we moved along. At one point (and keep in mind it’s about 8-8:30am now), a fisherman clearly fishing for shark hopped in his kayak and headed out, passing us by no more than a few feet. 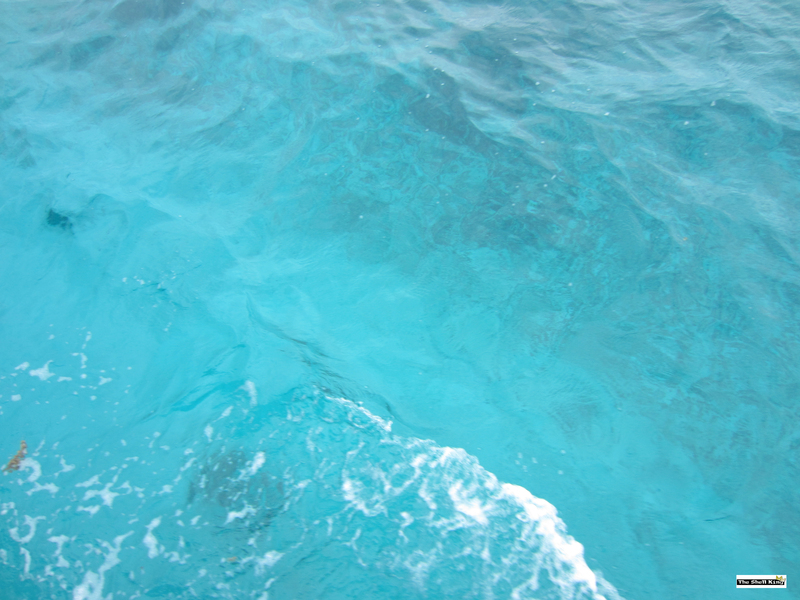 We continued to dive and collect shells and on our way back I didn’t notice a line in the water. When I came up for air, the fisherman whistled at me and gave me an aggressive gesture to move away from his line….and he was camped about 15 feet from the jetty….a jetty area that’s absolutely crawling with swimming tourists, locals and children throughout the Summer months – and the water isn’t always crystal clear since the Okeechobee overflows. Emphasis on the words “swimming” and “children”. Now as I mentioned previously, I fully support our fishermen. I just don’t support them fishing where people swim. I don’t support tossing unused bait in the water after a long night of shark fishing and I don’t support day fishing for shark where people swim. It’s asinine. This situation below is an example. Now picture a bunch of children to the left and five more fishermen on the right. There is an understanding on certain beaches locally. At Lighthouse Beach, fishermen gather near the pier. They don’t fish along the Western beach where the swimmers gather (as you can see below – no fishermen). This goes for Bowman Beach as well. Why this respect is not extended at Blind Pass/Turner Beach is beyond me. Common sense tells me that if someone is in the water swimming, don’t cast a line in the water. But some fishermen still do. Ok, maybe a 3 foot blacktip shark isn’t going to hurt much. Now replace that with a hungry 6 foot bull shark. 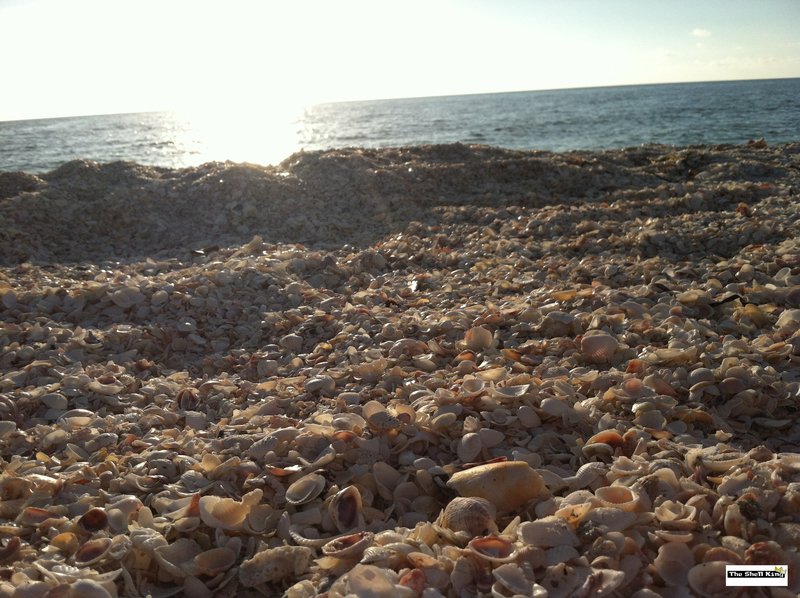 Sanibel Island is known for one thing – Shelling. It is the Mecca of the shelling world. It is not however, the shark fishing capital of the world. Sharks in a way are like dogs. If you leave out food in a certain area, they will eventually learn to feed there. Turner Beach is becoming that area. 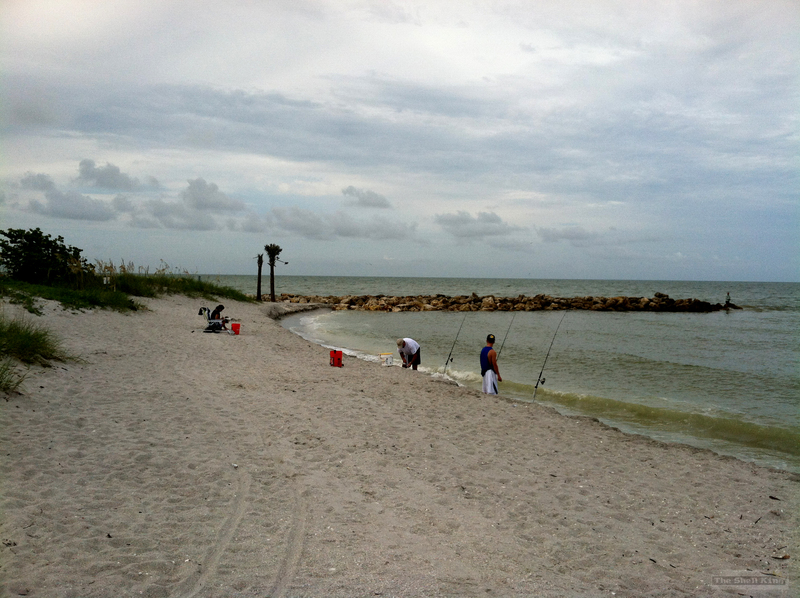 Some are calling for a buffer zone – 200 yards from the Turner Beach jetty extending North there should be absolutely no fishing. I agree with that view. Nope. Read up a couple of paragraphs. 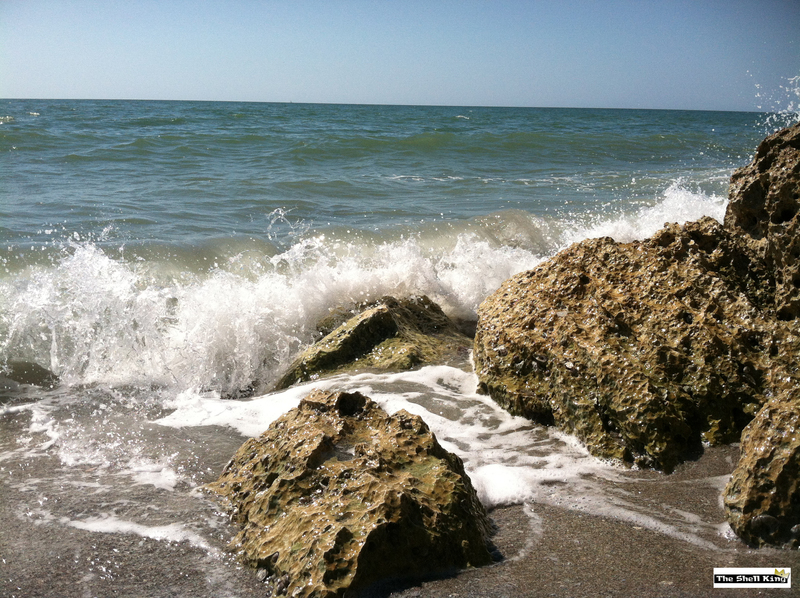 Sanibel is known for shelling and swimming. That’s what people come here to do. So they were here first. Not you. You wanna fish over the bridge into the pass? Go ahead. No one is swimming there. One day someone’s going to get bitten at Turner Beach. Perhaps, someone’s child. At that point everything will change…but then it will be too late. 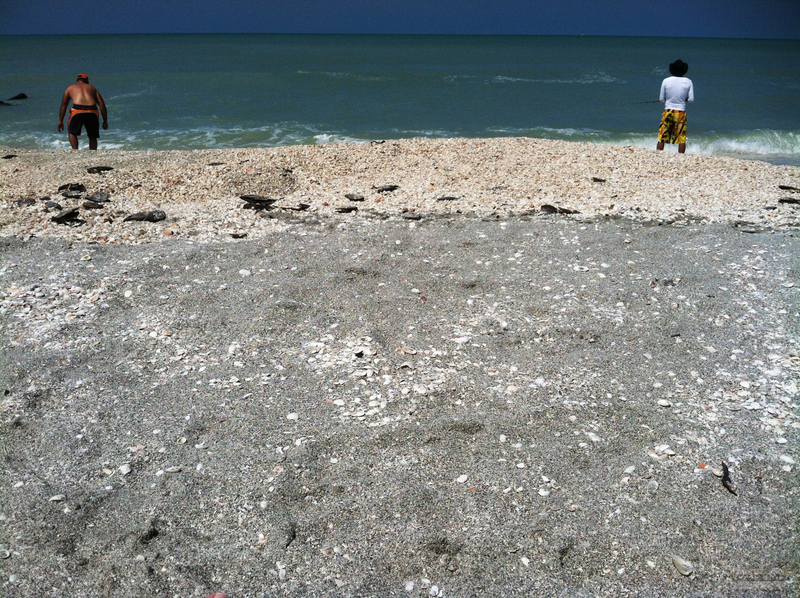 Sometimes, a few minutes after you hit the beach you can tell whether or not it’s going to be a good shelling day. Yesterday was that day. You can do both at the same time. I decided to do both. Now, during Option #2, there is always great entertainment. Not a “let’s watch and make fun of people” type of entertainment. More of a “did this person read the posted signs?” entertainment….or the “has this person ever seen the ocean?” entertainment. I do admit that sometimes I have laughed at what I’ve seen while being a people watcher. 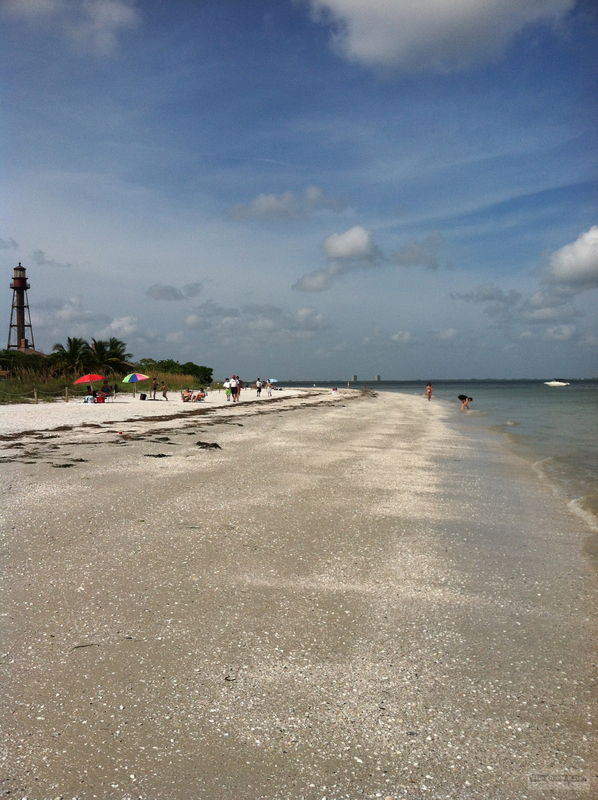 Like the time I saw a man come onto the beach at Blind Pass (it was 85+ degrees), dressed in a black suit. He kept his shoes (black dress shoes) and jacket on the whole time, posing for photos along the jetty rocks for well over an hour, while a woman in a bathing suit took several pictures of him using an iPhone. I write this post today, not to ridicule or make fun of anyone but to educate. Here are what I like to call Beach Basics 101. So, let’s first talk about Sunscreen. It is very important to apply sunscreen, because in this climate, you can get scorched fast. The Queen and I have been here for several years and we still get burned, either because we didn’t put on a high enough SPF or because we didn’t re-apply. Unless we’re constantly re-applying, normally we go 2 hours on the beach and then we’re done. Which reminds me, don’t forget sunscreen on the tops of your feet. My first weekend here, I neglected to put sunscreen on my feet. It was miserable to wear shoes for the next several days. Secondly, let’s quickly talk about sand. It gets hot in the sun. It will burn your feet, whether you think it will or not. Always wear something on your feet….sandals, flip flops, what have you. 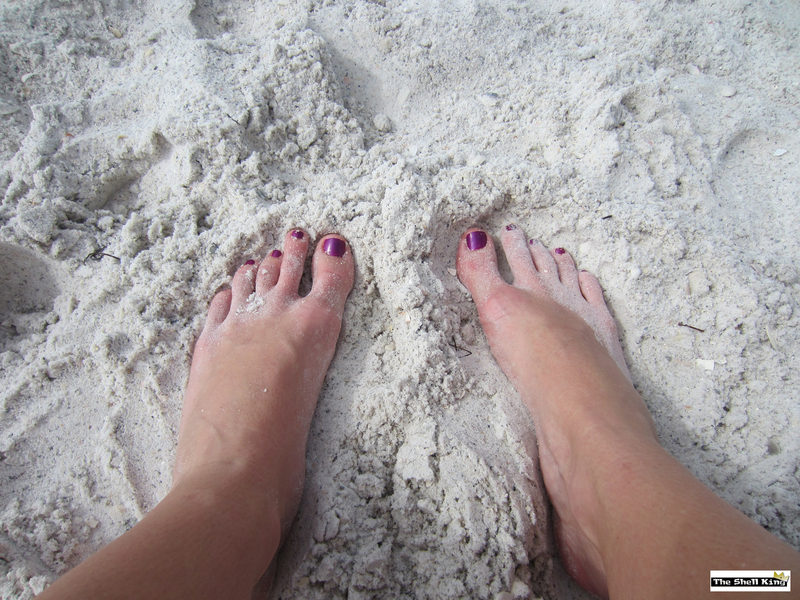 Let me repeat – that beautiful sugar sand that’s so nice to look at will burn your feet. If you’re going to be near jetty rocks, it’s smart to wear something on your feet. Trust me again on this one. My feet are now very used to walking on rocks and I still get the occasional cut on the bottom. Matter of fact, about a month ago I stepped on the wrong section of jetty rock and tore a nice gash into the ball of my foot. Speaking of jagged jetty rocks, let’s talk about snorkeling. Blind Pass is often hit or miss when it comes to snorkeling. Sometimes the water is calm and crystal clear. Other times, it’s rough and murky. You just never know until you get there. Yesterday, the water at Blind Pass was very rough. Shelling was sparse, fishing looked to be the same. Yet there were still people in the water, enjoying the surf. I made my way up the shore line early and saw that the water was just too rough and too murky to snorkel. Mainly, too rough. I like to snorkel. So I was disappointed. I made my way back to my chair and plopped down in disappointment. However, shortly after I watched a young lady (who was not in the greatest shape) grab her mask and snorkel and make her way down towards the front of the jetty rocks. As I watched her walk that direction, I turned to the Queen and said, “That’s not a smart move.” How she didn’t see the impending danger, I’ll never know. The water was extremely rough and we both foresaw what was about to happen. Sure enough, within minutes, she was being blasted against the rocks. After two minutes of fighting against the current. She was soon out of breath, tired, beaten and bloody and it took two men to pull her out of the water. By that time she was sobbing uncontrollably…another victim of Mother Nature’s waves. The Queen made a valid statement yesterday on the ride home. If there are people fishing, you probably don’t want to swim or snorkel near their bait. Especially if you have those kind of fishermen (and we’ve all seen them) who catch a keeper fish and decide to kill it right there in the water or slide it on a stringer. They’re basically chumming the water. We saw this all morning yesterday. So it’s not smart to swim near them. 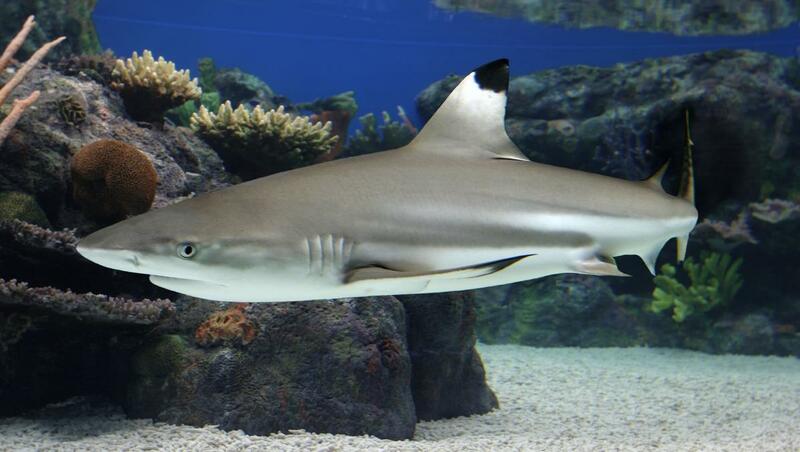 Especially out at Blind Pass, where it’s a known fact that Bull Sharks tend to hang out there. Now, there hasn’t been an attack in our waters in quite a long time, so please don’t let me frighten you. But if you’re wearing that nice new yellow swimsuit, some shiny earrings and you’re swimming 5 yards from a dude who just stabbed his freshly caught Redfish in the head – you’re putting yourself in danger. Don’t swim at dawn. Don’t swim at dusk. There are sharks on Sanibel. Lots of sharks. Be aware, my friends. 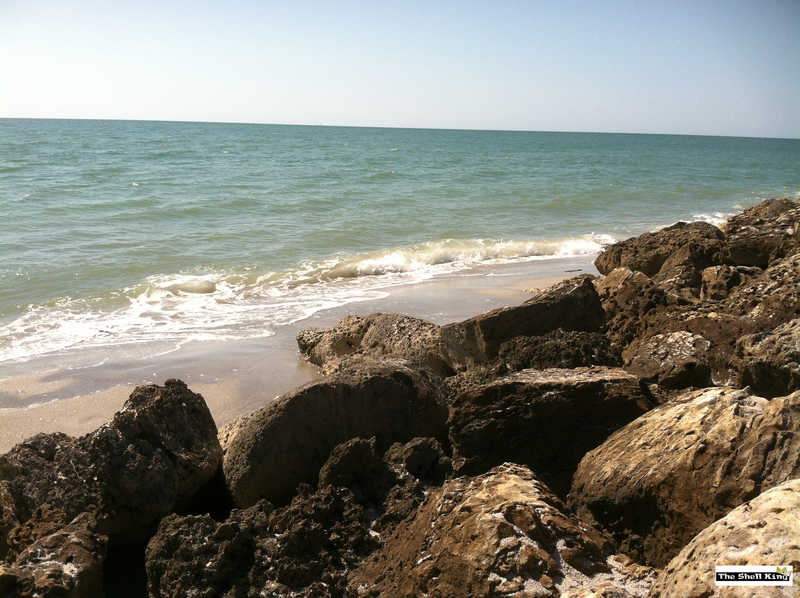 Along jetty rocks, you’ll tend to find Redfish, Sheepshead and Snook. They hang out and eat little fish. Bigger fish hang out and eat them. So it’s probably not a good idea to snorkel there, especially if the water is murky. We always bring a cooler with drinks – Gatorade, Juice, Water, Sodas, along with several snacks. Stay hydrated. These are just little basics of the beach that we’ve learned over the years. Sure, there are a lot more things that go with visiting a beach, but these are the ones that stand out to us. So enjoy your Summer and have fun at the beach. Just make sure to pay attention to the signs and above all, be careful!